Aesthetics: Tree stumps are often an unwelcome addition to the aesthetic appeal of the property. Maintenance: Tree stumps often prove to be significant hindrance in the maintenance of your property. Obstruction: Tree stumps prohibit any attempt at construction work being done on the property, rendering their area of occupation useless for any other activity. Over time, various methods have been used for stump removal from a particular property. Stump removal has been attempted in many ways: burnt, dug, pulled, or have been poisoned using chemicals. Out of all these techniques, the most effective method to remove a tree stump is by stump grinding. 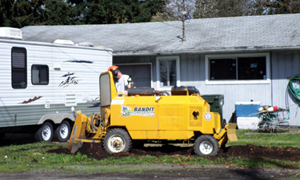 Stump grinding is done, as the name suggests, by a machine, which is designed specifically to grind up tree stumps and their roots by making use of a toothed metal wheel that chips away at the stump, allowing Tacoma commercial, and residential property owners to regain use of their property. With our expert tree removal services, you get the very best in tree stump grinding and stump removal service for your property. Our roster of arborists has been delivering expert tree removal services and stump grinding to our customers in Tacoma and has ample experience in tackling all kinds of stump grinding jobs. With our technology, methods and experience, no type of stump grinding and stump removal job is too challenging. 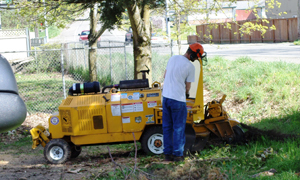 One thing property owners in Tacoma can do to reduce costs on our tree removal services, especially stump grinding, is to check their property, then try to clear an access path for our stump grinder to reach the stump they want removed. Remove any obstacles like loose rocks, gravel, metallic objects and any other such objects in the vicinity of the stump, in order to prevent any damage from happening to the stump grinding equipment being used. 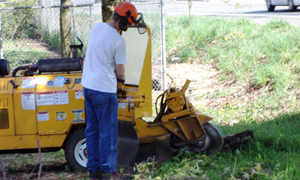 For Tacoma commercial and residential property owners seeking stump removal and stump grinding service, Hunter’s Tree Service brings its team of experts who have extensive experience in tree removal services. Call us today and get a fair and no obligation – free estimate on our tree removal services available in Tacoma.